Hard to describe how I’m feeling about the end of the pasta pass. It’s a mix between feeling like a good friend just passed away, and getting out of prison. I suppose they say that if you truly love something, you have to let it go. What am I going to do for lunch? Dinner? I’ll probably just starve, and curl up into a bowl and wake up when I’m about 20 lbs. lighter. The last pasta bowl ever? 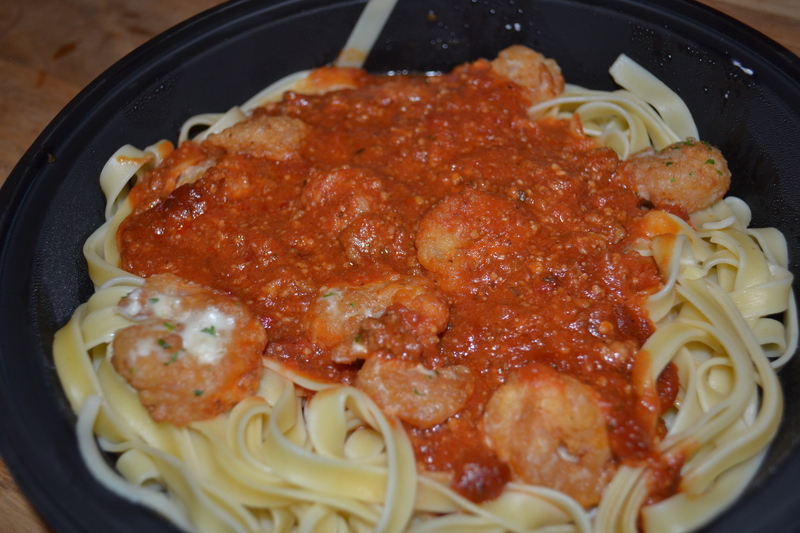 Fettuccine with spicy three meat and shrimp fritta. Looks like they started putting alfredo sauce on it before realizing it was supposed to be spicy three meat. Now, I kind of regret not having done a half and half sauce on one of the 49 days. That may be just about my only regret. Olive Garden, it’s been real, please do the pasta pass promotion again next year. Special thanks to everyone at the Center City Olive Garden – Marti, Dani, Will, Star, Tammy, Tammy, Wayne, and everyone else who was so pleasant and tolerant of the guy who came in every day. After all of that, I end the project 0.6 lbs. lighter than when I started. I will never fear a carbohydrate again. Thanks again!